SULSA’s Assay Development Fund is actively recruiting innovative molecular targets for which there is a strong rationale for therapeutic potential. Development of a high-throughput assay provide access to the various drug discovery initiatives that are available to the academic community, i.e. MRC DPFS, Bayer G4Targets, Wellcome Trust translational fund, the European Lead Factory, AZ innovation portal etc. There is an article in Nature describing a collection of problems that have arisen from incorrect chemical structures in biological screens DOI. I'm slightly surprised that this is regarded as newsworthy, but I guess it serves as a timely reminder. There is a very simple mantra you should adopt when analysing screening data "Trust but verify". Check compounds that were found active against the selected target are re-tested using the same assay conditions used during the HTS. Dose response curve generation: an IC50 or EC50 value is then generated, does it have a reasonable slope? Uneffected by incubation time. There is a strategy for the analysis of HTS data in the Drug Discovery Resources. The European Lead Factory Works! The European Lead Factory (ELF) is a collaborative public-private partnership aiming to deliver novel lead molecules for drug discovery programs. When the consortium was formed around 5 years ago there was a lot of scepticism about whether a group of 30 partners rating from large Pharma companies to small academic groups could ever agree on a legal framework that would allow the ELF to function. In a addition, in an industry where confidentiality was critical to maintaining intellectual property the idea that a group of large Pharma companies would share their sample collections often regarded as the "Crown Jewels" seemed impossible. However I was at the European Lead factory Stakeholder Meeting (24-25 April 2017) and it is clear that is has been a success. The latest issue of the European Lead Factory Newsletter has just been published. Highlights include the European Lead Factory recently reached the milestone of having received over 1,000 chemical library proposals for consideration. To date, 143,529 novel compounds, out of the 200,000 prospected compounds for the Public Compound Collection, have been synthesized, which means that the ELF compound collection grows daily by approximately 250 novel compounds to eventually constitute the 500,000 Joint European Compound Library (JECL). Parkinson’s UK and the University of Sheffield have launched a joint venture biotech company, Keapstone Therapeutics. Parkinson’s UK has allocated 1 million GBP over the next sixteen months to further develop compounds that boost the internal cellular defence mechanisms against oxidative stress. These compounds were discovered by European Lead Factory. There is an editorial in ACS Central Science DOI that I would encourage everyone involved in hit identification to read. Alarmingly, up to 80–100% of initial hits from screening can be artefacts if appropriate control experiments are not employed. They also emphasise the critical need for experimental validation for any screening hit. Such validation experiments include classic dose response curves, lack of incubation effects, imperviousness to mild reductants, and specificity versus counter-screening targets. If a molecule is flagged as a potential PAINS or aggregator using published patterns but is well-behaved by these criteria, it may be a true, well-behaved ligand. Ultimately, genuine SAR combined with careful mechanistic study provides the most convincing evidence for a specific interaction. Covalent and spectroscopic interference molecules act via specific physical mechanisms, for which controls are known. Colloidal aggregation, fortunately, is readily identified by rapid mechanistic tests and by counter-screening. In addition you need to consider compound identify and purity, reproducing the activity with an authentic sample is essential. Whilst time-consuming this validation work will save a fortune in the future. Having worked wit Selcia on a number of projects I always keep an eye out for news on their work on Peptidyl-Prolyl cis-trans Isomerases (PPIase). These are very interesting class of enzymes whose principal function is to catalyse the cis-trans isomerisation of the X-Pro peptide bonds in polypeptide chains (where X is any amino acid). This transformation is thought to be a mechanism to modulate protein function. PPIase enzyme targets are of increasing interest in drug discovery due to the extensive potential of small molecule inhibitors in a range of therapeutic areas, including infection, inflammation, cancer and neuroprotection. Selcia have now expanded the range of Peptidyl-Prolyl cis-trans Isomerase (PPIase) assays they can offer. I've worked with a couple of academic groups who have a very interesting target but no small molecule leads. Whilst there are several places offering high-throughput screening the stumbling block is often development of a robust screening assay running in a high density format. Most academic groups have little experience in developing such an assay and to be honest will need to do so very infrequently. The SULSA Assay Development Fund: accelerating translation of new biology from academia to pharma DOI describes efforts to support the development of such assays, work carried out in collaboration with the European Lead Factory in Newhouse. However, many scientifically interesting, novel molecular targets lack associated high-quality, robust assays suitable for hit finding and development. To bridge this gap, the Scottish Universities Life Sciences Alliance (SULSA) established a fund to develop assays to meet quality criteria such as those of the European Lead Factory. A diverse project portfolio was quickly assembled, and a review of the learnings and successful outcomes showed this fund as a new highly cost-effective model for leveraging significant follow-on resources, training early-career scientists and establishing a culture of translational drug discovery in the academic community. Perhaps this quote sums things up very nicely. The Wellcome Trust also provides Seed/Pathfinder awards that could cover similar projects. We are now starting to see some of the results of the screening of academic projects at the European Lead factory that was initiated in 2013. Dr Mahlapuu’s group, based at the University of Gothenburg, first identified a new target which could be used to reverse metabolic complications in type 2 diabetes. With the help of the European Lead Factory experts, she then screened the Joint European Compound Library of the then 320,000 industry compounds and identified a set of selective and potent small molecules which interfere with this target. They have now formed a spinout company to develop these leads. ScandiCure has received 1 MSEK from the 2016 SWElife program to continue the development of first-in-class anti-diabetic drug based on small molecule antagonists of a novel key mediator - serine/threonine protein kinase 25 (STK25). The latest news report from the European Lead Factory highlights work targeting antimicrobial resistance in collaboration with Professor Chris Schofield (University of Oxford). The high throughput screen of >300,000 compounds and initial triaging provided 50 qualified hits. Great to see projects like this move forward, demonstrates how important the ELF is in providing hits for academic groups/small companies. The latest newsletter from the European Lead Factory has just been published and highlights a number of notable achievements. As a result of the screening campaigns >3000 qualified hits have been awarded to private and public target owners. 72 public target programmes have been accepted, 48 high throughput screens finished and 41 hit lists with associated data reports handed over to the target owners. >150 bespoke assays have been developed in order to extract the most interesting hits for public programmes. There are now 450,000 compounds in the compound library of which 120,000 are novel compound specifically synthesised for the ELF. The European Lead Factory is a collaborative public-private partnership aiming to deliver innovative drug discovery starting points. Having established the first European Compound Library and the first European Screening Centre, the EU Lead Factory aims to give free access to up to 500,000 novel compounds, a unique industry-standard uHTS platform, and much more. We are now starting to see publications describing these endeavours.. I've updated the hit identification section of the Drug Discovery Resources. In particular I've added to the high-throughput screening analysis including more information on PAINS (Pan Assay Interference Compounds) first described by Baell et al DOI and subsequently summarised in an excellent Nature comment. These molecules — pan-assay interference compounds, or PAINS — have defined structures, covering several classes of compound. But biologists and inexperienced chemists rarely recognize them. Instead, such compounds are reported as having promising activity against a wide variety of proteins. Time and research money are consequently wasted in attempts to optimize the activity of these compounds. Chemists make multiple analogues of apparent hits hoping to improve the ‘fit’ between protein and compound. Meanwhile, true hits with real potential are neglected. Also added a page on Aggregators. Promiscuous inhibition caused by small molecule aggregation is a major source of false positive results in high-throughput screening. To mitigate this, use of a nonionic detergent such as Triton X-100 or Tween-80 has been studied, which can disrupt aggregates, and is now common in screening campaigns DOI. 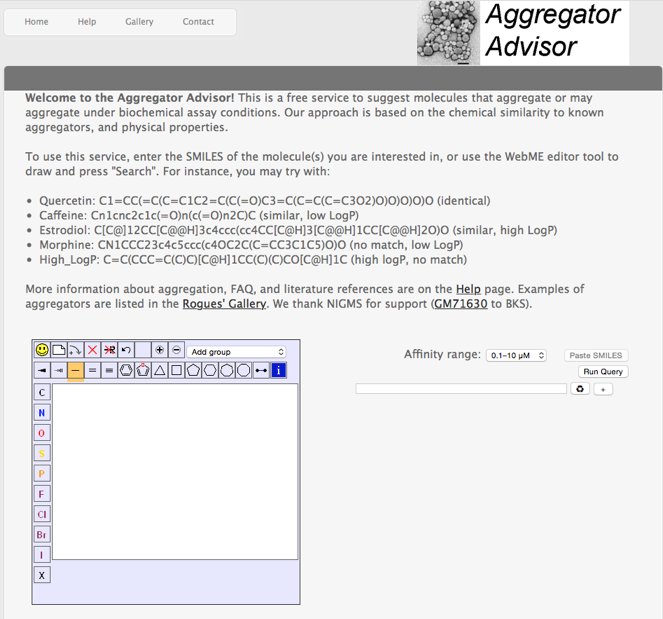 Aggregation is a regular concern when evaluating potential hits from screening and a recent paper "An Aggregation Advisor for Ligand Discovery" DOI attempts to provide an insight into this phenomenon, in addition they provide a useful web-based tool http://advisor.bkslab.org that provides a free service to advise whether molecules may aggregate under biological assay conditions. p>The European Lead Factory has just announced that an additional 50,000 new compounds have been added to their screening collection. This brings the collection up to 350,000 compounds and sets them well on the way to their 500,000 target. I've been involved in a couple of projects that have made use of this high-throughput screening facility and I've been impressed with the quality and diversity of the hits generated. The European Lead Factory was established to promote the discovery of novel lead compounds, suitable for subsequent optimization either to drug candidates or to high‐quality pharmacological tools for the experimental validation of targets. If you have a target you want to screen against you can submit a proposal online. For an academic or small company this is an interesting way to identify novel starting points for a medicinal chemistry program. 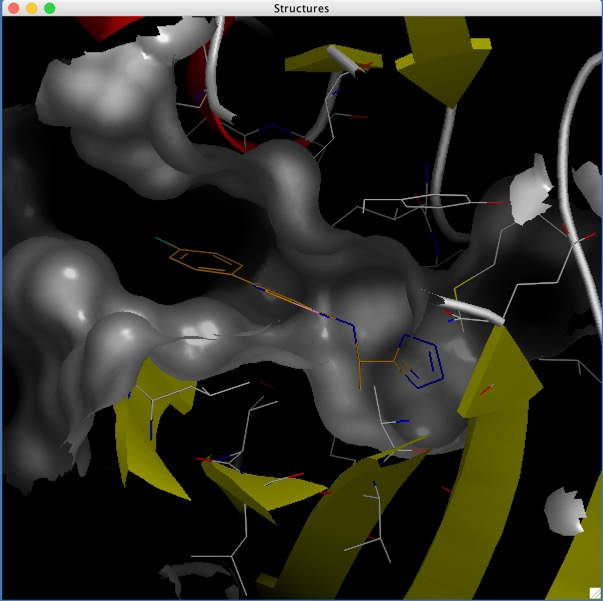 In the last few updates I’ve concentrated on Fragment-Based-Screening, where by screening a small set of low molecular weight fragments it is possible to obtain hits that can then be expanded. The latest update highlights the use of encoded libraries, here vast libraries (>>1M compounds) can be screened the hits isolated and identified by virtue of a DNA tag. From the early “proof-of-principle” peptide libraries this area has now extended into a variety of interesting chemistries. I’ve just started a section on Virtual Screening.